All A Bunch Of Momsense: Fill in the Blank/Five Question Friday! Fill in the Blank/Five Question Friday! 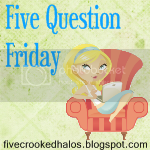 Mama M. hosts Five Question Friday. The (Un)Experienced Mom hosts Fill in the Blank Friday. Both of these lovely ladies post questions and we use them as launching boards to force information you never wondered about upon you tell you all about us! Answer the question below. You can either answer it here by leaving a comment, or you can answer it in a post on your blog and then head over to The (Un)Experienced Mom to leave the link to your post in the MckLinky list. Grab the button code there to throw in your post or add a link back to her blog so others can join in as well. If I had spare money that had to be donated to 3 charities, they would be _________, _________, and __________. Oh... The first two are easy. My third will be kind of a cop-out. The Alex's Lemonade Stand Foundation. You can read my "why's" in this earlier post, but in short, this foundation raises money to find cures for pediatric cancer. They get a button in my sidebar. And watch, 'cause you'll find me doing Avon for Alex fundraisers throughout the year! This one is pretty similar. And I love the Thanks & Giving. Give thanks for the healthy kids in your life, and give to those who are not. I'm so thankful for my healthy kids, and thankful that because of the work and research done at St. Jude, I have friends who can also give thanks. For the "newbies", who are joining in on Five Question Friday (welcome!! It's what all the cool peeps do! ;) Fo' shiz!! )...here's the rules: Copy and paste the following questions to your blog, answer them, grab the MckLinky code (or not...) and link up (a must!!!)!! I would be your best friend forever if you'd link back to me, Mama M.!! If you don't have a blog, but wanna join in...feel free to leave your answers in the comments below! In my teens? I wasn't a boygroup kind of girl, really. Unless you count Rancid or Nine Inch Nails as boy groups. And I think they might be mad. I did do the NKOTB thing when I was a "tween" - not that we called 'em tweens, then, but that's what I was. I am a failure. I have the best intentions about cards and stuff, and then... it just doesn't happen. I have BOXES of cards in my closet, just waiting to be mailed to happy homes. Oh the pressure! I'm not a big celeb kind of person... Sports people though, I guess they count. So.. Peyton Manning. He strikes me as a genuine person. I'd love to just hang out with him and the Colts squad as a whole. Technically it's my wedding band, and it's got my "unmentionables" beat. But outside of that? I'm such a jeans and t-shirt girl, much to the chagrin of the lovely ladies who have tried so hard to make a real "girl" out of me. Specific items? My Robert Mathis Colts jersey. Every game day. Without fail. Ok, peeps! Now it's YOUR turn! We wanna know, so be sure to post your answers, either in my comments, or on YOUR blog, and be sure to link up by visiting our hard-working hostesses! I need to learn how to grill. I can make hamburgers and hot dogs but that's it. Oh how much I would love to be able to grill! Our grill is covered in an inch of snow out on our deck. Love campfires too! Can't have one in our yard, but when we go camping, there's nothing like roasted ANYTHING on the fire. Uhm... what is a tween? Something went wrong with our propane on our grill two years ago, and my bangs went up in flames - yikes! My grill scares me, now! Maybe you could come over and do my grilling for me??? Please???? Great answers. I am so happy that everyone seems to know which charities they'd give money to if they could. Love to pay it forward!